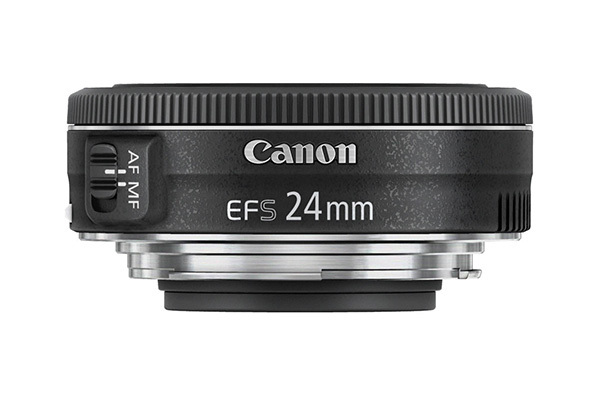 The ultra-slim Canon 24mm f/2.8 STM lens is just 22.8mm in depth – barely thicker than the lens cap – and weighs just 125g. Sounds intriguing doesn’t it? Couple this with a 24mm focal length and what you have is an extremely versatile and portable pancake lens. This is the second such lens to join Canon’s range, following on from the 40mm f/2.8 STM. And it should be noted that unlike the 40mm, the 24mm has an EF-S mount. This means that the lens will only work with Canon’s APS-C cameras (7D, 70D, 100D etc) and not full-frame DSLRs like the 6D and 5D MkIII. Since it only works with crop sensor DSLRs, the effective focal length of the lens translates to a versatile 38m. This makes it ideal for street photography, travel, portraits and landscapes where an ultra wide-angle field-of-view isn’t required. The 24mm f/2.8 STM uses a Stepping Motor to power autofocus. This technology is relatively new to Canon lenses, and was first seen in 2012. Essentially, this type of AF motor allows the lens to focus more smoothly than non-STM lenses, which is particularly advantageous when shooting video. This is simply because there will be almost no humming or buzzing from the motor as the lens attempts to find focus. The focusing speed of the lens is respectable, and is noticeably faster than the EF 40mm f/2.8. A thin but usable ring for manual focusing is present at the front of the lens. Although there’s no image stabilisation, the lens features a maximum aperture of f/2.8. This makes it ideal for low light photography, and for producing a pleasing shallow depth-of-field. The lens also provides an impressive minimum focusing distance of 16cm. While it’s no substitute for a dedicated macro lens, you can still get incredibly close to your subject for frame-filling images. The lens isn’t supplied with a lens hood, but you can buy one separately. The Canon 24mm is constructed of plastic with a metal mount, but is well-built and should be able to withstand the rigours of regular use. Attached to a 7D MkII, which is quite a large DSLR body, the combination is surprisingly discreet and produced high quality images. According to our test charts, the lens performs best between f/11 and f/14, providing extremely sharp images with minimal vignetting. Detail is softer at the corners when set to f/2.8, but the lens still produces good results. Some barrel distortion and vignetting could also be seen, but both at relatively modest levels and can be easily remedied during image processing. Overall, despite its diminutive size, the lens produces impressive images despite these minor imperfections. Perfect for street and travel photography, the 24mm f/2.8 offers great image quality in an extremely portable package. While there are cheaper prime lenses available, Canon’s new pancake is a reasonably priced choice for those looking to keep their kit bag as lightweight as possible, while achieving excellent image quality. This review was first published in the March 2015 issue of Practical Photography - download back issues here.